Joel Embiid dunks past the Lakers' JaVale McGee on Sunday. The 76ers just might end up being the team to beat in the Eastern Conference. Joel Embiid is the NBA’s best center and an MVP candidate. JJ Redick is one of the league’s best marksmen. At 6-foot-10 and lightning quick, Ben Simmons is a matchup nightmare for small guards. Jimmy Butler is a rugged closer. And newcomer Tobias Harris can score whenever he wants. 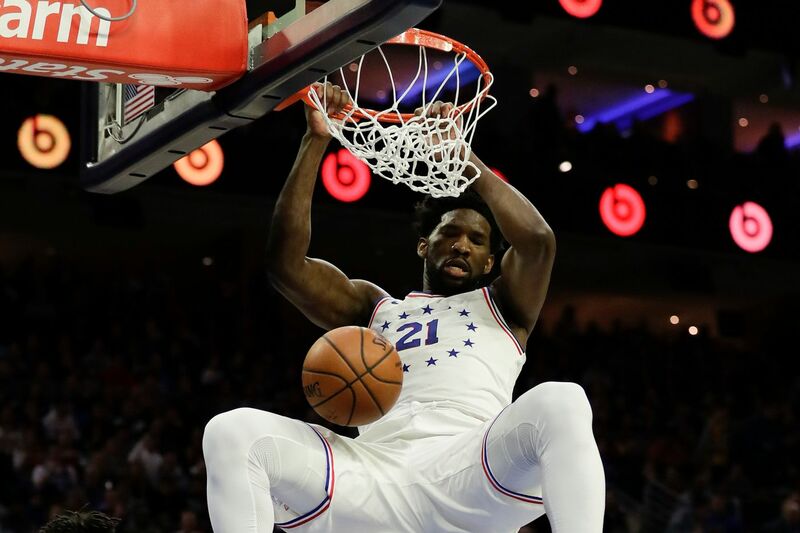 On Sunday, the Sixers showed the Los Angeles Lakers just how scary they’ve become since acquiring Harris and reserves Mike Scott, Boban Marjanovic, James Ennis, and Jonathan Simmons before Thursday’s trade deadline. The final outcome was a convincing 143-120 victory at Wells Fargo Center. The win came on the heels of a 117-110 decision on Friday over the Denver Nuggets, the Western Conference’s second-place team. The Sixers (36-20) have yet to utilize their whole offensive package because their new players are not yet up to speed. As expected, the team has a long way to go in that regard. The two-time All-Star starter continues his dominance against the Lakers (28-28), finishing with 37 points, a game-high 14 rebounds, three assists and one steal. Not bad for being a game-time decision with a stomach virus. But this kind of outcome was sort of expected. Embiid averages 31.8 points in five career games against the Lakers. That’s second only to the 32.5 points he averages against the Los Angeles Clippers. So what is it against the Lakers? “I think it goes for both L.A. teams," he said. "I must not be a big L.A. fan. But I don’t know. It’s fun. Joel Embiid had 37 points in the Sixers' win on Sunday. He wasn’t the only Sixer with a big game. Harris lit up the Lakers in the first quarter before setting in and taking a backseat to teammates the rest of the way. Making his first six shots, the power forward scored 14 of his 22 points in the opening 12 minutes. Redick (21), Butler (15), and reserves T.J. McConnell (13) and Marjanovic (10) were the Sixers’ other double-figure scorers. They had 10 players score at least three points. On the afternoon, the Sixers shot 57.7 percent from the field, including going 12 of 24 on three-pointers. They also had 33 assists compared to just eight turnovers. The Sixers broke the game open with a 20-4 run that stretched from late in the third quarter to early in the fourth. It gave them a commanding 116-96 lead with 10 minutes, 32 seconds left. They went on to lead by as many 26 points with 44 seconds to play. The eighth-year veteran said he never had that before in his career. “To be a part of it now, I love it," he said. New Sixer Tobias Harris dunks over JaVale McGee during the first quarter of Sunday's game. Harris finished with 22 points. He also loved that Simmons attempted a three-pointer 56 seconds into the second half. It was his just his third three-point attempt of the season. The 2018 rookie of the year missed all three attempts and is 0-for-14 in his career. However, just attempting the shot in the flow of the game was huge. His other attempts were long-distance heaves at the end of a shot clock or the end of a quarter. “I just felt like I might as well pull it,” he said. “I didn’t really think about it." Simmons and coach Brett Brown have talked about him being more aggressive. He finished with eight points on 3-for-13 shooting to go with a team-high seven assists, one block, one steal and just two turnovers. Lakers power forward Kyle Kuzma led all scorers with 39 points, with 23 coming in the first quarter. LeBron James had 18 points, 10 rebounds and nine assists. Mike Muscala had eight points in his first game with the Lakers. The Sixers traded him to the Clippers on Wednesday. The Clippers then traded him to the Lakers on Thursday. But the Lakers were no match for the Sixers on this day.